penbox.co.uk Blog | Prestige pens, pen refills, nibs & ink from the Penbox pen shop. Since 2003 each year Graf von Faber Castell have produced a limited edition superior oversized fountain pen, each produced for one year only and referred to as the Pen of the Year by GvFC. Every pen being individually numbered and presented in an exclusive luxury gift box with papers, brochure, and a certificate certifying that the pen is produced for a limited period only. A large 18k two tone nib is the beating heart of these fountain pens. Above we have photographed the Graf von Faber Castell Pen of the Year 2007 in petrified wood, which having recently obtained, we now have for sale at Penbox. The pen has never been filled and is as originally supplied from Graf von Faber Castell. We feel that this pen will not be available for long, especially at this price, so grab it whilst you can. New from Pelikan and now at Penbox is the latest special edition Pelikan M800 Stone Garden fountain pen and matching ballpoint pen. This pen looked to have a very attractive finish in the pre launch media pack images issued to retailers, and now having taken delivery at the shop we can confirm that the media images were not misleading, and that the marbled barrel, dark blue cap, filling actuation knob, and nib section on the fountain pen combine to result in a fascinating finish. The 18k two tone nib comes in a choice of grades. 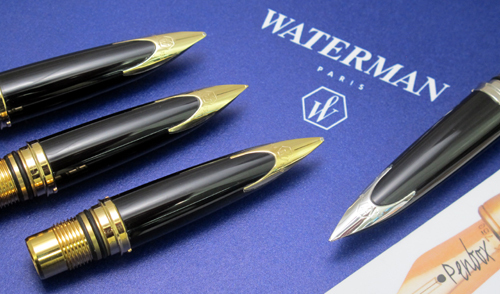 If you are looking for a replacement nib for your Waterman Carene fountain pen, at Penbox we have a wide selection of Waterman’s 18k Carene nib units to suit most users. Choose from EF, F, M, B, OF (oblique fine), OB (oblique broad) or stub. Above is a sample of the finishes and nib grades of this semi inlaid nib that we have available online or from our pen shop. As they are supplied as a complete front end, replacement Waterman Carene nibs just screw into the barrel of the fountain pen when changing. These 18k nibs come in a gold or silver finish depending upon the finish of the pen. 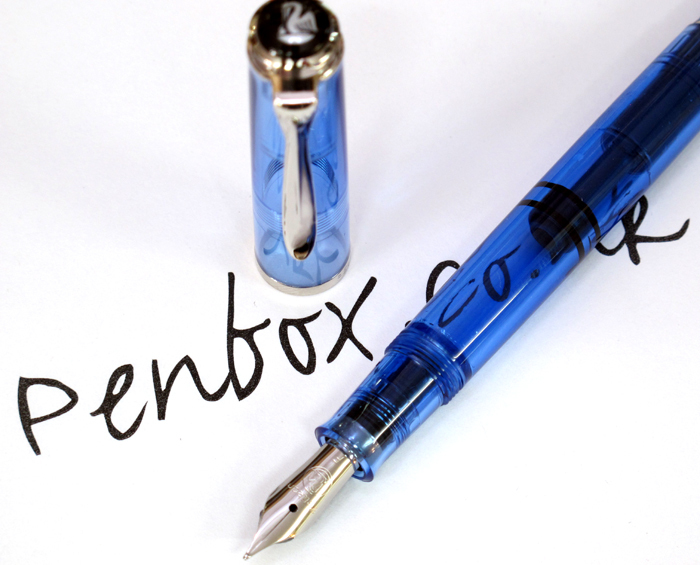 The special edition Classic M205 Demonstrator Transparent Blue fountain pen was first produced in 2009. In 2016 Pelikan produced the fountain pen with an amended finial with platinum detail on the top of the pen cap which matches the cap lip band and the pocket clip. The transparent blue barrel is the same to allow a view of the workings of this piston filling fountain pen from Pelikan. The stainless steel nib is currently available in EF, F and M. Penbox now have some more stock of this Classic M205 demonstrator from Pelikan.